Why Outlander Really ‘Scored’ with Bear McCreary. Bear McCreary performing score of Outlander at its World Premiere SDCC. I was lucky enough to be invited to and attend the World Premiere of Outlander at San Diego ComicCon this past weekend (fourth row center —gah!). 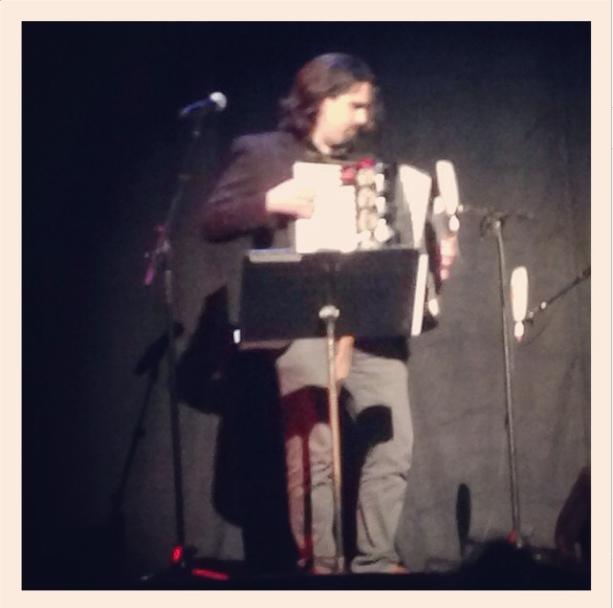 Before the screening, the audience was treated to a performance by Composer Bear McCreary on the accordion, Musician Paul Cartright on the fiddle, and Singer Raya Yarbrough. “…Scottish music and culture has been an obsession of mine for nearly my entire life. Growing up in Bellingham, WA, my friends and I attended the Highland Games every summer for over a decade…First hearing the rolling and relentless Bb drone of the bagpipe bands get louder as we parked the car and headed towards the grounds gave me the euphoria that most little kids probably feel going to Disneyland…that drone would burrow into my brain, so deep that I could recall it for days, like a residual echo. When Rob Roy and Braveheart came out in the same year, I saw them each in the theaters ten times. When I learned to drive, I cruised my hometown blasting bagpipes from my car speakers. Bear is the real deal; passionate and dedicated with complex tastes—a perfect match for Outlander. I for one absolutely cannot WAIT to buy a copy of the soundtrack as soon as it (God-willing!) becomes available! I LOVE that he wants to hear from us! That just shows how committed he is to the integrity of the music and, by default, the show. How lucky are we? Yes, I too am a huge fan of Scotland and the music. As I have said before, after having been to Scotland, and learning that my family is a sept of the MacGregor clan, Scotland is my favorite country, and am looking forward to going back. It’s great that you have such advantages. I love all kinds of music from different countries and your music for Outlander is beautiful Mr.MacCreary ! Congratulations ! I’ll read your blog. The problem at the moment is WHEN the Outlander series will be available in European countries ?? Thankyou. Does anyone know if a soundtrack will be available? That was so beautiful. I thoroughly enjoyed! Thank you. The opening song for Outlander is constantly in my head. That woman’s voice is so resounding, enchanting, lovely!